I approach iOS-ified versions of classic arcade and console games with a healthy mixture of anticipation and trepidation. On the one hand, it’s nice to see all those games I wasted all those hours playing in my misspent youth making an appearance in my slightly less misspent adulthood. On the other hand, the graphics and gameplay of two or three decades ago doesn’t always translate well to Apple’s state-of-the-art handhelds. 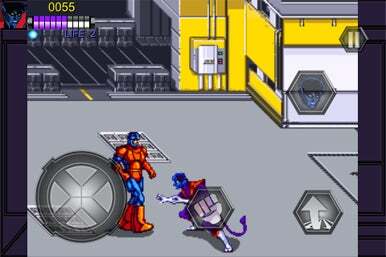 That’s been my mindset as I took a mutated stroll down memory lane with X-Men, the early ’90s arcade stalwart that Konami Digital Entertainment ported over to the iPhone and iPad. (The game runs in optimized form on both devices, though—screen size, aside, plays the same no matter which iOS handheld you use.) Konami has done a great job recreating the look and feel of the old arcade game in iOS form, from the controls to the soundtrack to the Saturday morning cartoon-style voice work. But anyone looking for anything beyond a pleasant serving of nostalgia is going to come away from X-Men disappointed. Bamf: Nightcrawler is about to unleash some teleporting fury on a Magneto-controlled minion in X-Men. I’ve taken advantage of the game’s customization features to move the on-screen controls to spots that are convenient for my fingers. In case you were more frugal with your quarters than I was back in the day, X-Men lets you control one of six mutants (Cyclops, Colossus, Wolverine, Storm, Night Crawler, and Dazzler) in a battle against evil forces commanded by Magneto. You fight your way through each stage, with a boss—an X-Men villain like Pyro or The Blob—waiting for you at the end. Really, the plotline—which includes a kidnapping of Professor X—is incidental; this game really exists so you can go around punching baddies. You’ve got four buttons at your disposal—a d-pad for moving your X-Man around the screen, a jump button, an attack button for delivering righteous punches and kicks, and a final button that unleashes your mutant power on your enemies. That latter button saps you of energy, as does getting punched, kicked and shot by Magneto’s minions. Lose too much energy, and you’ll squander one of the eight lives you get at the start of each game. Konami does a fine job of translating X-Men’s arcade controls to the iOS’s touch interface. The onscreen buttons rarely get in the way of action, and only a few times did my notoriously fat fingers land on the jump button when I meant to do some punching. Konami includes a work-around for clods like me, though—the ability to customize where on the screen the virtual buttons appear. The original X-Men let your quarter-toting friends join in the battle against Magneto. In a nod to the conventions of iOS gaming, Konami offers a multiplayer mode in which three other players can join in over a local network. The process is about as simple as can be—one person hosts the game, and the other players join in. Users in the App Store complained of some lags in multiplayer games, though it was something I never experienced in my testing. I did experience a shortcoming of X-Men’s multiplayer setup, however: When one player quits, the game’s over. 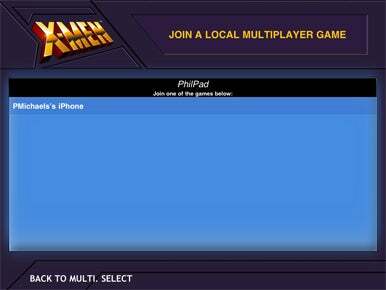 Shall We Play a Game: If you’re on a local network with another X-Men player, it’s easy to take advantage of the game’s multiplayer features. There are a few other differences between the arcade and iOS versions of X-Men. When you run out of lives, you have the option of continuing the game from where you were killed off. (Your score resets to zero.) But unlike in the arcade where your ability to keep playing depended on how many quarters you had on hand, in the iOS edition, it’s just a matter of tapping the screen to continue. A player with enough time on his hands could play right to the end of the game in a single sitting. When you opt to continue the game, however, you can’t change characters. That’s sure to disappoint veteran X-Men players who like toggling between the six different heroes as they progressed through the game. X-Men makes a seamless move from the corner arcade to the palm of your hand, though I have a hard time believing that anyone who didn’t grow up with the original will see this old-school game as anything other than old. For iPhone and iPad gamers who hold the arcade original close to their hearts, the game is a worthwhile blast from the past, especially if they’ve got like-minded friends who can take advantage of the multiplayer capabilities. Still, for all its strengths, X-Men on the iOS platform is solely a recreation, not a re-invention.